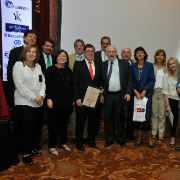 The Pablo Neruda Auditorium at the Paseo La Plaza complex was filled to overflowing by a crowd of Latin American professionals who were intellectually enriched by the novel ideas of Argentinian and Israeli technological and educational leaders. 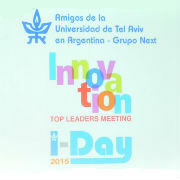 Organized by the Argentinian Friends, the Innovation conference was attended by over 700 people. Participants heard from 10 speakers in a series of TED-style talks on the latest advances in neuroscience, space research, nanotechnology and telecommunications. The speakers included NASA Chief Engineer San Miguel Martín; Google Argentina CEO Federico Procaccini; Microsoft Argentina and Uruguay CEO Diego Bekerman; Satellogic Founder and CEO Emiliano Kargieman; Buenos Aires Minister of Modernization, Innovation and Technology Andy Freire; Dean of Argentina's Nanotechnology Institute Soler Galo Illia; TAU Dean of Life Sciences Danny Chamovitz and TAU's Dr. Dinorah Friedmann-Morvinski. The conference was moderated by Gerry Garbulsky, Curator of TEDxRíodelaPlata, TEDx representative in South America and professor at the World of Ideas. 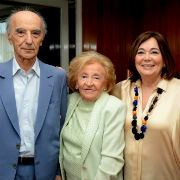 Click here to see video footage of the talks (in the original Spanish).